Should I trade in my Deemax for 823/hope ? Discussion in 'Downhill & Freeride' started by tuumbaq, Jan 17, 2013. Ive had a set of 2010 Deemax for 3 years now and I just cant kill those wheels.I replaced the free hub and bearings last years , barely ever need to true them and I just cant believe the abuse they can take. Now that said and this may sound silly but Im tired of seeing my silver flashy wheels being carried over my new bikes every years ;-) A friend of mine offered me to trade them for a set of brand new 823 on hope evo hubs.I know the 823 are solid rims and have a set of hope hubs that a I love on my trail bike but will they be just as strong ? What about the weight , will I be gaining a bunch of weight ? What do you guys think , good deal or not ? Isn't the 823 and Deemax rim the same with a different spoke count? Seems like a no brainer? Whats in it for him, if he's trading new wheels for 3yo wheels that seem like they would have been comparable. I also was under the impression that the Deemax rim and 823 were the same thing. I don't have any time running the Deemax wheels, but I've been running my Hope Pro 2 and 823 combo on the rear for 2 years now with no problems. I've had to tighten spokes and do some minor truing from time to time, but I have zero flat spots. I think the Pro 2 and the Evo hubs are the same except that the Evos come with fancier bearings(?). That said, the Pro 2s have been flawless. I've taken them apart and regreased them after each season, but everything always looked fresh on the inside and the maintenance wasn't really necessary. Hope hubs are light too, though I'm not sure how they compare to the Mavic hubs. A set of used Deemax still goes for around 500$ on the used market and mine are flawless. I need a change,I want to get new wheels but cant seem to find the info I'm looking for and wouldnt want to miss my Deemax...Anyone knows the weight of a rear 823/Hope combo ? Deemax uses 823 rims with a bit of material milled from them. Unless the wheelset uses light spokes you will be gaining some weight though. I thought they were actually exactly the same. Sounds like a bit of a wash then? Maybe it comes down to if you want black rims? Killing 823s prematurely is in most cases bad wheelbuild or not checking the tension. Yeah, methinks that that the wheelbuilder perhaps learned his craft a bit more. I am running my 823's for fifth season now. Perfect and true. However I do have a wheelbuilder that really knows his craft. Yes. I cased the crap out of my 823s. Did drops to flat ledges and the only things that happened were small dings. With a properly built and tensioned wheel it's hard to kill most rims. Many people just use bad builds and forget about spoke tension. I've seen real hacks get 1-2 seasons out of really soft rims. Not exactly. Here's why it isn't. Get the Hopes. Pull the front rim off and save it for rear, and throw a Flow on the front to make it lighter. the 823's are very stiff. Not sure how that compares to the Deemax. I went 3 years without a flat running tubeless, then ripped a big chunk out of the tire and had to run a tube. I then flatted 8 times in the next 3 weeks on a number of different tires. Setup tubeless again, and no flats for another year and a half. I'm convinced that the 823's don't give, so it becomes pinch flat city with tubes in. You know I never really gave it much thought, but the same exact thing happened to me. The only time I flat on the 823's is when I tear the side wall (happened 2 times in 5 years). I run tubes for a bit... flat like f'n crazy... Go back to a new tire and tubeless, golden. If you run a tube, run a 729. The wider profile and rim shape minimized pinched tubes. 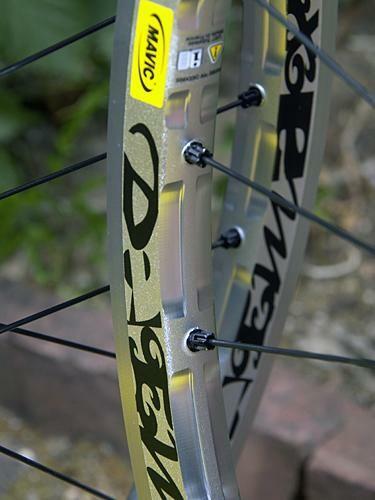 The 729 rim or 321 for us old timers; was the original Deemax rim before there was a tubeless option. I thought they used 721/521s for deemaxs originally. Or at least some pros ran them painted yellow as DeeMaxs.